1 of 3 In small bowl, stir together sour cream, 2 tablespoons of the cilantro and 1 tablespoon of the lime juice; set aside. 2 of 3 Coat an 8-inch nonstick skillet with nonstick spray; heat over medium heat. Add green pepper; cook 3 minutes. Add cod to pan and sprinkle with 2 tablespoons of the lime juice, the salt and 1/4 teaspoon of the chili powder. Cover; cook 15 minutes or until fish is cooked through. 3 of 3 Flake fish in a medium-size bowl; add skillet contents. Add remaining cilantro, lime juice and chili powder to bowl; stir gently. Heat tortillas. 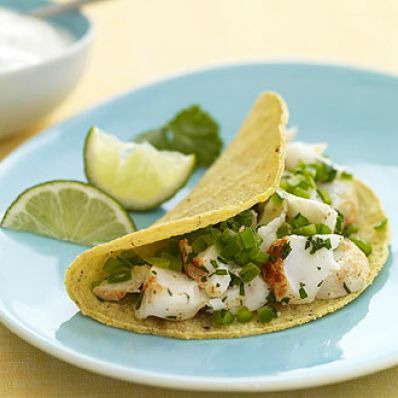 Divide fish among tortillas and serve with sauce.